If you want to floss regularly but can’t seem to get into the habit, this post from Providence Dental in North Las Vegas is for you. Flossing is so important to good dental health that we want to give you a few ideas for unique times to floss so you can keep your teeth and gums healthy. If you’re an early riser, try flossing in the morning right after you brush. Try just after lunch, but before you go back to work. Before or after you exercise. Your oral health is just as important as your physical fitness. Keep some floss in your gym bag and give your teeth and gums some attention along with the rest of your body. While watching your favorite TV show (Game of Thrones, anyone?). While taking a bath. Any task is more enjoyable if it can be done while relaxing in a warm tub. Light some candles and play your favorite tunes for an at-home spa experience. 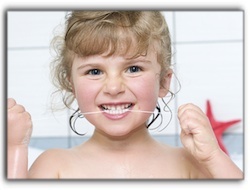 We hope this gives you some ideas to help you make flossing part of your daily routine. Just before bedtime, however, is still the best choice. Food particles left on teeth can turn into plaque while you sleep. The bacteria in plaque erodes enamel, creates cavities, and adversely affects gum tissue. At Providence Dental in North Las Vegas, we care about the dental health of your entire family. We offer children’s and family dentistry, and a range of other services. Please call for an appointment today.